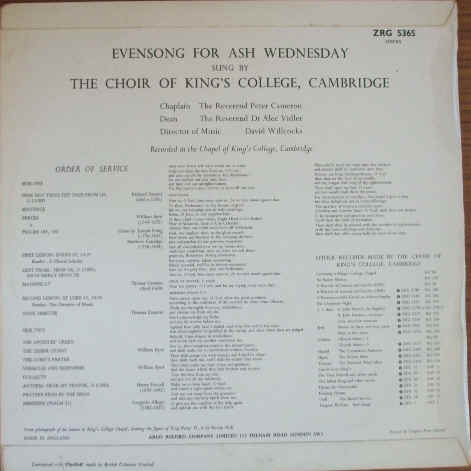 33rpm LP Record of ZRG 5365 EVENSONG FOR ASH WEDNESDAY, sung by The Choir of King's College, Cambridge. Director of Music David Willcocks. Sleeve printed by Graphis Press Limited. 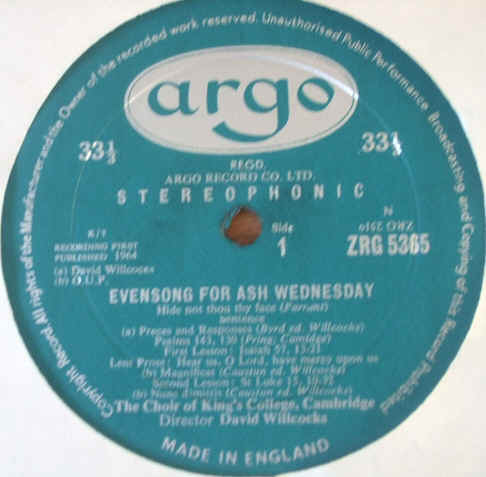 Pressed by ARGO Record Company Limited in England. Oval (non-grooved) label, released in 1964. TAS listed. The record itself is graded excellent, with no visible scratches/marks when viewed under normal house lighting. 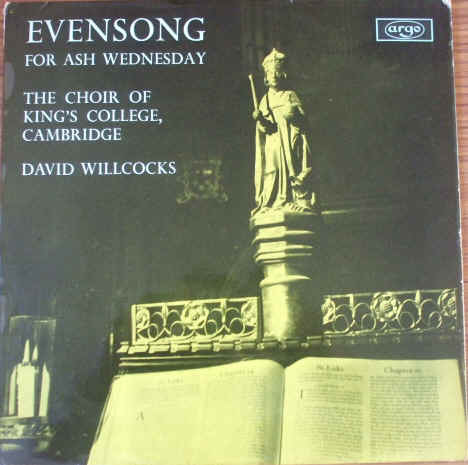 Excellent sound quality, with NO jumps, ticks or crackle and just the odd dust pop on Side Two, but is otherwise a stunning recording with no other discernible blemishes. Minimal to no spindle wear. Labels very clean, one or two light spider marks. The outer sleeve is graded at least very good, with no more than minor storage and handling wear (light sticker removal residue to front top corner, leaving it slightly sticky). On the whole this is an excellent item.